Today, I welcome writer and cover designer Scarlett Rugers writing as Scarlett Archer to my blog. Scarlett has been kind enough to answer a few questions for me. 1. First of all, why don’t you tell us a little about yourself? I live in Melbourne, Australia. I’m a huge movie fanatic and watch movies all day while I work- I usually have something on in the background! I run my own Graphic Design business and try and write when I find a spare hour in the day. I’ve only just realized in the last day or two I have a new closet crush: Daniel Radcliffe but only post Harry Potter. And I’m becoming addicted to Pinterest. 2. 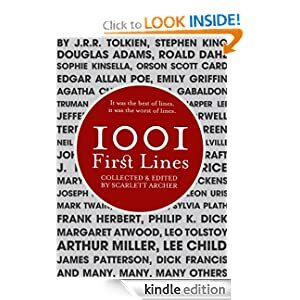 Your book, 1001 First Lines, is non-fiction? So do you see yourself as a fiction writer, a non-fiction writer or both? My non-fiction book was a once off. At least so far. I’ve not felt compelled to write any other non-fic, and this wasn’t writing. It was just editing and compiling. I definitely still consider myself a fiction writer and I don’t think that’ll change any time soon. 3. As the title implies, your book is a collection of memorable first lines from literature. So how did you get the idea? I was considering the first line for one of my novels and wanted to get some good examples. When speaking with others about it and doing some research on the internet I realised I wasn’t the only one curious about the art form of the first line. It was then I decided to put together the first lines so that I had it all in one place- and share that with other writer’s who had the same compulsion as I. 4. Even for an avid reader, finding 1001 memorable first lines – or rather finding them again, when you vaguely remember having read them somewhere – sounds rather daunting. So how long did it take you to write the book? It took four months from woe to go. That includes days of working on it for 8-10 hours. It was the collection of lines, rechecking them, refining them, formatting the pages, designing the front and back, sending it to editors and then ordering the proof. I began in November and finished in February. 5. Your book collects many classic first lines by Jane Austen, Charles Dickens or Edgar Allen Poe. But there also are plenty of quotes from authors who are still living and still under copyright. Did you contact those authors and ask for permission or did you rely on fair use? And did you have any problems getting permission? The fair use act was definitely applicable in this instance since I wasn’t changing or claiming any of the work as my own, and there’s about a 10% threshold when dealing with the use of other writer’s work in your own. The first line is such a tiny percentage that it was safe to move forward and produce the book. 6. So of all the 1001 first lines in your book, which one is your favourite? ‘The man in black fled across the desert, and the gunslinger followed.’- The Dark Tower by Stephen King. 7. The first thing I noticed about 1001 First Lines was the striking cover. And of course you also work as a freelance cover designer. So can you tell us a little about that? I work exclusively with self-published authors and have been running a promotion of doing 30 covers for $50. The feedback I’ve been getting is that my work is very professional and of high quality and that encouraged me to keep going. It made sense to me to combine my two passions in life- writing and design. I’ve been a designer for six years and a writer for over fifteen so I think that gives me an advantage of knowing how hard writer’s work, and being able to interpret what they sometimes struggle to for a visual representation of their story. I hope to establish a great relationship with the widespread writing communities everywhere. I saw book covers being produced that were below par and I felt I could make a positive contribution to the self-publishing industry to help destroy the ‘lower quality’ perception that a lot of people have. Designing professional looking covers helps that, I hope! 8. What are some of your favourite cover designs (trad or indie) of the past few years? I fell in love instantly with Vladimir Nabokov’s series designed as a display box. You can see the collection here at the Book Cover Archives. 9. What’s your favourite of the covers you’ve designed? I’m writing a dark retelling of The Wizard of Oz, and designed this poster for it that I’ll be adapting to a book cover eventually. I can’t wait to see that on a paperback cover, I think it’ll look great. 10. Are there any cover design trends you don’t like at all? The lack of typography knowledge. The self publishing industry is booming, and a lot of writers are taking it upon themselves to design their own book covers. This is great except they focus on the image and not the text. The font face, placement of text, size and balance of type on your cover can have a dramatic effect and can make your cover look amateurish or brilliant. I’d like the trend of DIY book covers to start paying attention to their type as well as their image choice! 11. Do you think that the indie publishing revolution is offering new opportunities not just for writers, but also for freelance translators, editors, designers such as yourself, etc…? I think ignoring the fact the revolution is happening is a big mistake for anyone on the fringe. The editors, ghost writers, designers, proof readers, formatters should all take advantage of this. Especially if you have a lot of experience and can show your skills. This is an industry that is dire for professionalism on all levels- grammar, spelling, formatting, structure, design. With other freelancers in the wings it gives us a great push in the right direction to give self-publishing a positive face! This entry was posted in Books, Writing and tagged first lines, interviews, interviews with other writers, judge a book by its cover, Scarlett Archer, Scarlett Rugers. Bookmark the permalink.